Anyone who has ever seen an animal experiencing a seizure will know that it is a “hair-raising” event. Seizures or ‘fits’ is a well-described phenomenon in domestic pets. The way in which a fit or seizure presents can vary significantly, from what seems to be a brief moment of absent-mindedness to full blown body contractions where the animal is semi-conscious and lying on the ground shivering, shaking and convulsing, with foam coming out the mouth and looking like it is busy dying. Owners, and even vets who may have seen such seizures in pets quite often, still find it disturbing at the best of times. The difficulty with finding the cause of seizures is that there are many different causes, which all manifest in a similar way. It can almost be compared to hay fever in humans. In some cases hay fever may be caused by pollens, in other cases by the dander associated with animal hair. Regardless of the cause, the symptoms are the same with varying degrees of itchy and running nose and eyes, sneezing and blocked-up sinuses. Seizures therefore are not a diagnosis in itself, but merely a symptom of an underlying condition, which may have a completely different origin, but leads to the same symptom. Finding the underlying cause may in some instances be very simple, and straightforward, but in many cases may require extensive workups over an extended period of time, with the final diagnosis made not by finding the cause, but, by eliminating all other potential causes. systemic infections like rabies or tetanus. spontaneous electrical discharging in the brain like with epilepsy. the twitching or paddling movements of the legs in dogs whilst they are sleeping, sometimes associated with vocalisation, which are not seizures at all but involuntary movements associated with deep sleep. As with all symptoms of disease, it is important to find the underlying cause of seizures and to treat that, rather than to just treat the seizures symptomatically. 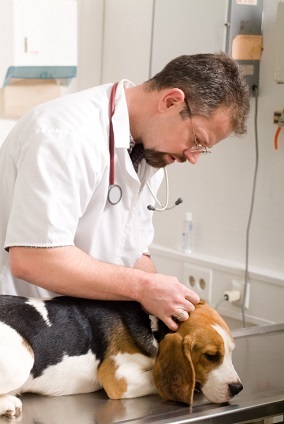 In some cases, if a definitive diagnosis cannot be made immediately, the vet may have to treat the symptoms with short acting anti-convulsing drugs and then address the underlying problem. Many of the conditions mentioned have specific tests and or diagnostic procedures which can definitively diagnose the cause of the seizures. One condition which cannot be definitively confirmed with diagnostic procedures and tests is epilepsy. This diagnosis is usually made by way of eliminating other possible causes of seizures. In some cases the diagnosis can be relatively straight forward but in other cases, it may be quite a challenge seeing as there are different forms of epilepsy. Epilepsy is the term used to describe seizures that are due to “electrical malfunctioning” of the brain. The most distinguishing characteristic of epilepsy is that it causes seizures which are usually unprovoked and recurrent. Most epileptic seizures are brief (less than two minutes) and tend to be isolated events. A seizure occurs due to abnormal brain activity where the balance between stimulatory and inhibitory impulses to nerves is disturbed and a spontaneous electrical discharge occurs. It can be likened to a lightning bolt during a thunderstorm. This discharge, if prolonged, can itself cause further damage to the brain (after 20-30 minutes of sustained seizure activity) and thereby increase the likelihood of more seizures occurring. This means that finding the underlying cause of repeated or sustained seizures, and treating it, as well as responding therapeutically to the seizures themselves, is imperative. Seizures may differ substantially in presentation from a brief lapse of attentiveness or change in mental state, to mild and localised involuntary muscle contractions and spasticity, to severe and generalised convulsions with wild trashing and spams and a loss of consciousness. The seizures associated with epilepsy are usually classified according to the origin in the brain and are either partial due to a localised area of the brain being affected, or generalised due to a larger area of the brain being affected. Partial seizures are further classified according to the extent to which consciousness is affected where simple partial seizures do not affect the state of consciousness whereas complex partial seizures do affect consciousness. In partial seizures, limited parts of the body are usually affected due to the localised nature of “electrical malfunctioning” comparable to a single lightning bolt. There is no loss of consciousness, but the animal clearly behaves “out of the ordinary” which may include symptoms like nervousness and agitation, or attention seeking behaviour. The seizures may present as twitches of certain muscles or muscle groups, repetitive chewing movements without having any food in the mouth, sporadic spasms of certain body parts, continuous or repetitive circling, or behaviour like “fly biting” where the animal will repeatedly snap at nothing. About eighty five percent of partial seizures progress to become generalised over time. This occurs because other areas of the brain become affected by seizure activity and lose its electrical stability. Generalised seizures always lead to a loss of consciousness as it involves “spontaneous discharges” occurring over a large area of the lobes of the brain (an intracranial cyclone) and as a result the body as a whole. Primary or idiopathic (unknown cause or origin) epilepsy tends to be generalised and usually occurs due to hereditary predisposition with certain purebred animals, for example Labradors, being more prone to this kind of epilepsy compared to mixed breeds. Generalised seizures involve the animal’s whole body. The animal experiences a loss of consciousness which leads to it losing its balance and falling or rolling over. Varying degrees of shivering, shaking, tremors and convulsions will be present and the animal may paddle with its limbs, vocalise and foam at the mouth. In some cases this may also be accompanied by urination and defecation. The duration of these fits usually last a few minutes after which the animal will settle down and “wake up”. Where seizures become a continuous series of up to five minutes each with incomplete recovery in between, it is called “status epilepticus”, and always require veterinary intervention. Status epilepticus should be regarded as an emergency, as it can result in death due to respiratory or cardiac arrest. Secondary or acquired epilepsy is usually due to localised brain lesions caused by factors such as trauma or lack of oxygen to the brain. This type of epilepsy usually presents with partial seizures and may progress to the generalised form over time. Treatment of epileptic seizures depends on its frequency, intensity and duration. If seizures are of short duration and occur infrequently, it need not be treated. If seizures occur more than four times in a month, or repeatedly more often than once every four to six weeks, then treatment is advised. Cluster seizures, where more than one seizure occurs within twenty four hours, may have to be treated. This is because seizures of this type can progress into status epilepticus. It is important to note that the aim of treatment of epilepsy is control, and not cure. Treatment requires therapeutic monitoring by routine repetitive blood tests and clinical evaluations to assess efficacy and potential side effects of treatment. In many cases epilepsy medication needs to be adjusted in dose and type of medications used, due to the build-up of tolerance over time. Interestingly, seizures in cats are much rarer than in dogs and are usually acquired rather than having a genetic basis. In felines the most common cause of seizures is structural brain disease, and the severity of seizures cannot be used to assess prognosis. Treatment is aimed at reducing the frequency of seizures to less than one episode per six to eight week period, and is often successful. Seizures are a fairly common but complex phenomenon, and require a systematic and rational work up to ascertain the underlying cause. Blind, symptomatic treatment is possible but is not advised as the primary reason for seizure activity could become worse or cause further damage to the patient if not diagnosed and treated. Seizures in pets are serious and can be progressive, but owners can be comforted by the fact that the tools for diagnosis and treatment are many. With sound veterinary practices, seizures can often be controlled such that quality of life is not adversely affected, and the pet can carry on to live a long and happy life.